I did it. 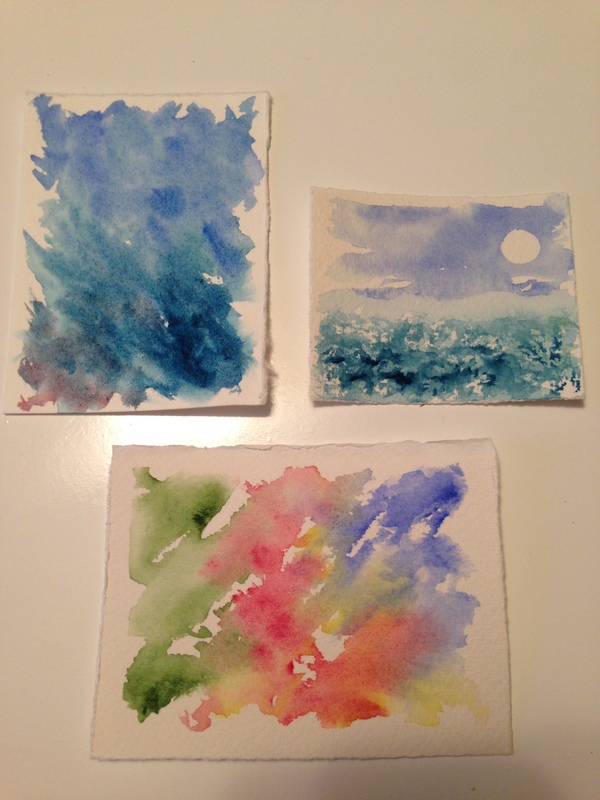 Finally tore into the good watercolor paper. Could resist no longer, after seeing a class on Artist’s Network TV today, on top of an inspirational post from Sand Salt Moon a few weeks back. The long and short: Work small! It’s less intimidating, fun, and a great way to play with your colors and get to know what different papers can do. The largest paintings here are business-card sized. Most are about 1.5″ x 2″. I really enjoy working small! Arches paper may indeed be worth it. The paint is easier to control, and I love the texture. The el cheapo I live with (inside my own head) may need to find good watercolor paper on sale. Anyone have a better source than Blick? Really love Cobalt Turquoise, Prussian Blue, and of course Ultramarine and Cobalt Blue, too. I love the way they harmonize together. Oh! I could make these little paintings all day and never get tired of it. Are we warming up for the dance? April has just knocked me over with her beauty this year. Is anyone else feeling the spring love? The tulips are blowing me away. I think I’m feeling a tulip reappearance here tomorrow! Peace, everyone. Michael’s prices are insane compared to Blick’s, even with the coupon for what I’m looking for. I’ll have to check for this though and see, good thought! Also. Have you heard of cheapjoes.com ? Yeah, I need to look again there too! I’ll report back, if I find something better. Zippity, my favorite are the ones with sun/moon. And the colors react differently on good paper. Good for you, working small and seeing all the different effects you can create – every way, every day. Having fun! Love your new Zippy name too. Do-da! Have you broken out the good paper yet? Thanks for the inspiration, Cynthia. It really was fun to make tiny pieces. And they’ll go great in my quilts!! Aw, shucks. (Blushing) Yes – I have Arches, and two other brands of 140 lb. I remember you said you were saving your good paper, so I was wondering if you’ve tried painting on it yet lol! I had mine for months before finally trying it, argh! I hear you on the waiting but IMO you are way talented. Seriously. Your work is going to explode (in a good way) with the other materials. Were you an artist in a past life? I think your skills are extraordinary! Are you brand new to art, or just to watercolor? I just remembered – they sell business card sized Strathmore 140 lb “artist trading cards” paper stacks at the craft store – look for it. I’ve been using their paper though and I’m not thrilled with it so far. I’m trying different grades of it at this point. And I’m going for a torn look also. Thx for the tip though! Work small is such great advice. These are cool. What fun little pieces! You can hand print your personal information on the back and actually use them for business cards. What a wonderful way for others to remember you! I’m so glad to hear that you have gotten in to the good paper! Watercolor paper seems expensive – and it is if you buy it off the rack at a store. Cheap Joe’s, Blicks, and Jerry’s Artarama usually have a good sale a couple of times a year, and I stock up then. I bought 80 sheets (22″ x 30″) last winter and paid $4.00/sheet. Seems like a lot of money, but that amount of paper should last me all year (until the next great sale!) I take the sheets and divide them into the size I want. 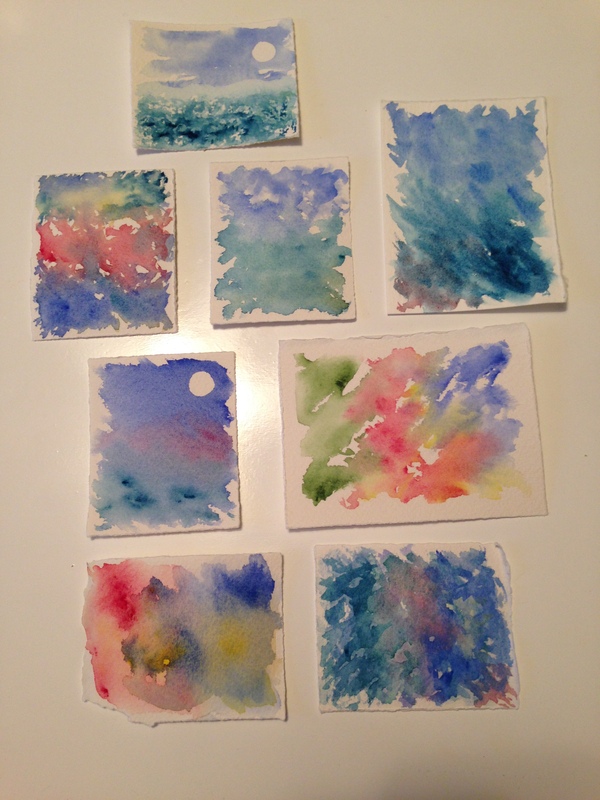 I get 13 – 6″x8″ pieces for doing 5″ x 7″ little paintings, which works out to about 30 cents apiece (15 cents if I paint on the back), or 6 – 9″x11″ for 8x10s plus a fun little strip that’s good for little paintings like you’ve done here. Thank you! Great idea, to use them as business cards. $4/sheet sounds like a really good deal, Ruth! And thanks for the tip re: using the back. I’ve painted on the backs of some that I didn’t like as well yesterday, and I see no difference. Bonus! 😀 Is there a “right” side to Arches WC paper? I’ve been scratching my head over that. Yes, but the difference between the front and back is hardly noticeable. If you have a full sheet, you can tell the front from the back by the watermark. Some of my students use Arches pads, and the texture on those seems a little different from either side of the full sheets, but I haven’t investigated that a lot. Ok, thanks! Is the watermark side the front? You can see the watermark from both sides. The “right” side is when the watermark is forward or reads correctly. Gotcha. Thanks again for your help! Thank you so much! I was thinking of the ocean. I’d love to do seascapes and skyscapes, especially. (Oh, who am I kidding, I wanna do everything.) I’m looking forward to your tulip art! I’m sure they’ll be lovely. It is so wonderful to have all of the tulips in bloom. OOh, I never knew you were mixing paintings with quilts! Neat, I’d love to see! Yeah, looking around, only Utrecht beats Blick’s price, and only by a little tiny bit – today, at least. (They’re both owned by the same company.) Thanks for the info, as always, Jill! I appreciate it. Arches is totally worth it. That’s all I use (and I like the “hard” stuff, the #300 hot press. Yikes!). Thanks for your input, Maggie. I’m afraid to try the 300#, I’m sure I’d be hooked!! Lovely. I like working small as well. I can get into details more as well. I’ll post some pendant soon which I’ve been working on. I buy a huge role of arches….I love arches. It sure is wonderful, Marika. I’ll look forward to seeing your small work!! I can feel your liberation with the tearing of the paper!! Small can definitely be less intimidating…love to read about it! I’m glad, Rebecca! It’s so much fun, working small! And easier for some reason. It’s really helping me improve at watercolor.